Drums by the man who helped shape the sound of alternative rock: Steve Albini. Steve Albini’s imprint on the sound of rock is undeniable. Having worked on seminal albums by the Pixies, PJ Harvey and, perhaps most notably, Nirvana’s milestone record “In Utero,” his sonic DNA is in the fabric of productions that have helped create a new branch in rock history. This collection of drums captures the incomparable sonic fingerprint of not only Steve Albini but also the ambience of his very own studio, which he personally built and designed. Welcome to Electrical Audio in Chicago, IL, and a truly unique collection of drums. 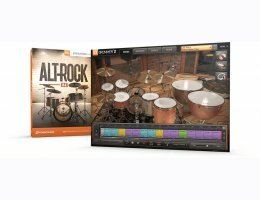 The Alt-Rock EZX presents a crude, genuine and raw palette of drum sounds with an incredible range, perfect for the soft-loud-soft approach that is synonymous with the distinct dynamics of the classic alt-rock sound. Capturing Steve’s unique method of mic placement, attention to detail and drum tuning scrutiny, this EZX gives you two full kits and cymbal setups as well as several additional instruments and percussion pieces, all crafted to perfection. Even though this EZX takes off in the tremors of the nineties alt-rock scene, it presents a tonal palette with enough color to aid you in painting whatever sonic landscape you wish. Recorded by Steve Albini at Electrical Audio. Two (2) full kits and cymbal setups (Ludwig Club Date & DW Collector’s Series). Five (5) additional snares, two (2) kicks and five (5) cymbals. Five (5) percussion instruments, including 26” and 29” Ludwig timpani drums. Comes with a selection of MIDI drum grooves inspired by alt-rock music. Windows XP, PIII/Athlon 1,8GHz with 512 MB of RAM. A compatible AAX, AU, RTAS or VST DAW or audio host application. Mac OS X 10.5, G5 1GHz with 512 MB of RAM.